Metamucil is known generically as Psyllium and is a brand of fiber and bulk-producing laxative supplements that was owned by G.D. Searle and Company from 1934-1985. In 1985, Procter & Gamble purchased the brand. 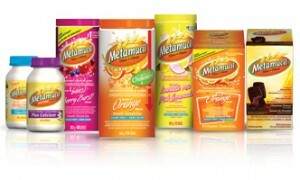 Metamucil is available in a sugar free version and a variety of different flavors, including orange, pink lemonade, and berry. It can also be taken in different forms, including powders, capsules, wafers, or a clear liquid that can be added to coffee and other beverages. Metamucil is taken as a fiber supplement to make up for the dietary fiber that may be lacking in a person’s diet. It can also be used to treat constipation and to increase the bulk in stool, which can assist the digestive system by causing movement within the intestines. This drug also works to increase the amount of water that is found in stool, which in turn makes it easier to pass. Metamucil can be used as a self-treatment for constipation or other intestinal issues, or it may also be prescribed by a doctor. It is important to follow all directions on the product package when self-treating. It is also recommended that the medication be taken with a full glass of water in order to prevent choking, and wafers should be chewed thoroughly before swallowing. Metamucil dosages will be based on medical condition, response to treatment, and age.